Contact Press Images, the international picture agency, was co-founded in New York in 1976 by French-British journalist and editor Robert Pledge and American photojournalist David Burnett. The purpose of the agency was to facilitate the independent production of in-depth and documentary essays, and to develop a humanist photography attuned to major international issues and social currents. Contact, which in its early years trained its collective lens on the little-known disease, Aids, has long specialized in long-term projects -- political, religious and human rights issues -- that often take photographers years to complete, bringing together men and women of diverse backgrounds and nationalities, the key to its singularity and strength. The agency has conceived and produced exhibitions, monographs, catalogs, and many individual and collective works. Click here for more info about the agency. 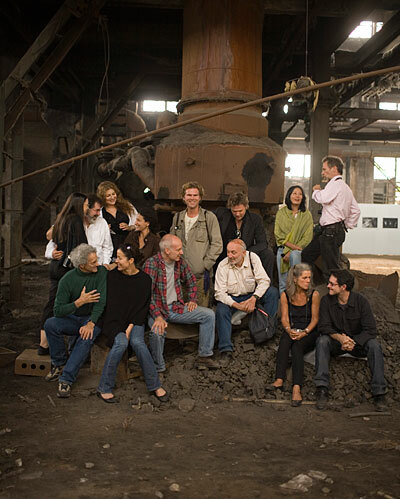 Contact photographers at the Pingyao show in 2006, clockwise top left; Lori Grinker, Kenneth Jarecke, Alexandra Avakian, Nadia Benchallal, Charles Ommanney, Stephen Dupont, Yunghi Kim, Edward Keating, Sean Hemmerle, Jane Evelyn Atwood, Frank Fournier, Nick Danziger, Kristen Ashburn, David Burnett.